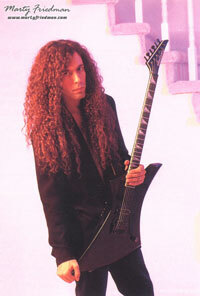 Marty Friedman (born December 8, 1962 in Washington, D.C.) has become recognized worldwide as a guitarist and composer of consummate skill and a style of playing that is instantly recognizable as uniquely his. 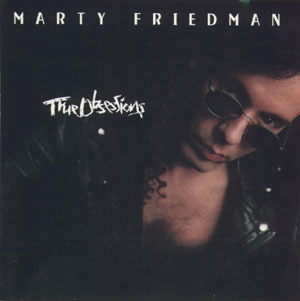 Marty is a self-taught guitarist famous for his natural improvisation abilities and for pioneering the fusion of exotic Eastern musical scales with Western musical styles such as neo-classical, thrash metal and later on into rock, pop, jazz, metal and anything in between. Going beyond traditional scales, Marty often arpeggiates the chords he is playing over, his picking technique is unorthodox and his bends and vibrato are very distinctive. He was the lead guitarist for the thrash metal band Megadeth for a period of almost ten years (from February 1990 to December 1999). During this period, perhaps its most successful, Megadeth released a string of gold and platinum albums. At the same time, Megadeth's musical style became less Thrash, and more melodic, which many attribute primarily to Marty's creative influence. Prior to joining Megadeth, he formed and played lead guitar in several bands that attained loyal and faithful followings, including Deuce, Hawaii, Vixen (not the all-female band of the same name), and notably Cacophony. Marty collaborated with Jason Becker on two albums, "Go Off" and "Speed Metal Symphony" that are considered masterpieces and works of reference for pure virtuoso and creative guitar playing. His solo albums, including one in conjunction with Japanese maestro Kitaro, reveal the wide range of Marty's musical exploration, from the very melodic music of "Scenes" and "Introduction" to the hard driving rock of "Music for Speeding", to the variety of styles presented in "True Obsessions". His solo albums seldom conform to a specific genre and often reminds the listener of Marty's creative exploration in music. Currently living in Shinjuku, Tokyo, Marty travels the world giving eagerly anticipated clinics, performances and master classes in dozens of countries in Asia, Europe, and North and South America. He has become a major force in the Japanese music scene, playing lead guitar in the bands of the some of the country's most famous performers. He is also making his mark as a popular versatile and talented performer on several hit shows on Japanese television, and as a columnist for a major Japanese music magazine and a national daily newspaper. Marty speaks fluent Japanese. He once appeared on TXN's musical TV program "hebimetasan" with Japanese idol Yoko Kumada etc. Marty has recently appeared on the track "Born Of Anger" on the album "All That Remains" by Fozzy. Marty is a big fan of The Ramones, KISS (during its early years) and Frank Marino.